The VOA Hausa (www.voa hausa.com) Muryar Amurka (Voice of America) Hausa Service radio news. The voice of america (VOA) Hausa or VOA Hausa (www.voa hausa com) muryar amurka service news hausa radio is a website of International news across all subjects. Every day VOA's Africa division broadcast for you international and regional news in English and eleven other languages, which includes hausa language. VOA has correspondents in Abidjan, Cairo, Johannesburg, Nigeria hausa news and Nairobi, as well as a network of over one hundred journalism throughout the continent. It has a clear signals and very easy to access when compare to BBC Hausa. It broadcasts on AM (Attitude Modulation). For voa hausa service, check your local listings for times or look on VOA News website www.VOANews.com/TVToAfrica for stations in your area. MONDAY-FRIDAY - Daybreak Africa - Get your day off to a fresh start with the Daybreak team as they present news, interviews, sports and live weather forecasts. FOCUS - Commentators provide thought provoking analysis to clarify complex issues in the news as well as historical and cultural topics. Africa World Tonight - Kim Lewis hosts this evening program bringing you the latest news, sports and music developments in Africa, the United States (US) and around the world. Opinion Roundup - U.S. and world media opinion, expert discussion and VOA listener letters. Talk to America - An international call-in program broadcast live on radio and the Internet. Host Doug Bernard engages the world wide audience in a daily dialogue with a variety of American decision-makers, personalities and experts on far ranging subjects. Call collect to join the discussion - 1-202-619-3111. Talk to America Africa-New! - Host Doug Bernard and the Africa Division's Shaka Ssali or Vincent Makori, as well as other Africa Division personalities, discuss African and world issues with international callers in a recorded version of the weekday program. World of Music - Join Rita Rochelle for the world's best music and guest interviews, including artists from the African Diaspora. Music Mix - Enjoy a variety of American and international music, as well as up-to-date music industry news and live performances. See program clock for specific kinds of music on each day. MONDAY ~ New American Voices - Hear the stories of immigrants living and making new lives in the United States. TUESDAY ~ Global College Forum-New! - Each week, host Marsha James speaks with students from around the world who are studying in the United States. Housecall Chinedu Offor hosts this live call-in health program that puts listeners directly in touch with medical professionals. WEDNESDAY ~ Wordmaster - VOA's Avi Arditti brings you the fascinating stories of words and phrases found in today's English language. Straight Talk Africa - This call-in program examines topics of special interest to Africans, including politics, health, social issues and conflict resolution. Shaka Ssali hosts this program, which is broadcast on radio, television and the web. THURSDAY ~ International Press Club-New! - Judith Latham talks with editors of English-language newspapers around the world as they discuss major topics of global importance. FRIDAY ~ Sonny Side of Sports-New! - VOA's Sonny Young opens the phone lines for his listeners to call in with questions and comments on the African sports scene and an occasional interview with African sports stars. Call collect 1-202-619-2077. Hollywood Highlights-New! - Alan Silverman brings you a weekly look at the American movie industry from Hollywood. SATURDAY & SUNDAY ~ Point of View - This weekend program looks at an important issue of the day, from both sides, with Marsha James and Yeheyes Wuhib. Its true that you can get your voa hausa news via your smart mobile phone or hausa.voa.mobi/ hausa.voa mobile or hausa.voa mobi/ voa hausa.com/mobile/ voa hausa mobile websites. VOA news are from the American angle and does give a US propaganda, only partially objective. Voice of America VOA which broadcast or airs its news at 6 am. VOA tell you this is an editorial hausa news, they'll tell you this is their opinion so that you don't have a problem. Voa news hausa or VOA programmes are also relayed on FM in Niamey, Maradi and Zinder through partnerships with Radio Tenere, Radio Anfani and Radio Sarraounia. Much of the Hausa service programme content is produced at studios at Abuja and Kano in Nigeria. The VOA Hausa Service has been broadcasting continuously since 1979. The aim of VOA Hausa.com (www.voa.hausa.com) staff/ mp3/ live/ mobile/ facebook/ labarai/ shrin dare/ listen online/ audio is to encourage unity amongst hausa speaking people via its website voa hausa.com news radio service. The voa hausa labarai or hausa voa first went on the air in 1942, is an international multimedia broadcasting service funded by the United States of American government through the Broadcasting Board of Governors. Voice of America hausa (or voa hausa online) broadcasts to approximately 1500 hours of news, information, educational and cultural programming every week to an estimated worldwide audience of 125 million people. FM stations in Sierra Leone (102.4 FM), Kenya (107.5 FM) and Ghana. Voahausa (voa hausa radio) - Listening to Voice of America was more widespread. Hausa VOA listeners are generally seemed to accept that the broadcast was the point of view of America and that it helped them to build an all round understanding of issues. It's like voa are trying to sell America. VOA Hausa Service: Monday-Friday at 0500-0530, 1500-1530 and 2030-2100 UTC, on Saturday at 0500-0530, 1500-1530 and 1800-1830 UTC and Sunday at 0500-0530 and 1500-1530 UTC. The Voahausa.com Muryar Amurka is the Jaddawalin Shirye-shirye. You can easily listen to daily VOAHausa broadcasts Shirin Hantsi/ Shirin Safe/ Shirin Dare/ Shirin Rana to keep in touch with what's happening in the world in Hausa people and hausa language. The Voahausa service is one of the most reliable source of current Hausa news service. 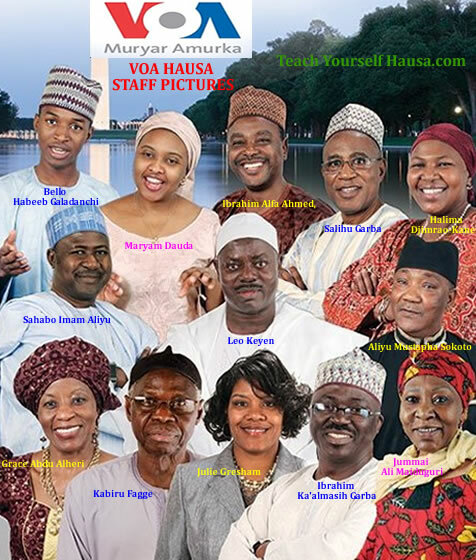 Below is the voa hausa service staff photos . Maryam Dauda and Bello Habeeb Galadanchi. Middle from right: Aliyu Mustapha Sokoto, Leo Keyen and Sahabo Imam Aliyu. Below from right: Jummai Ali Maiduguri, Ibrahim Ka'almasih Garba, Julie Gresham, Kabiru Fagge and Grace Abdu Alheri.